The GtkNotebook implementation of the Buildable interface supports placing children into tabs by specifying “tab” as the “type” attribute of a <child> element. Note that the content of the tab must be created before the tab can be filled. A tab child can be specified without specifying a <child> type attribute. To add a child widget in the notebooks action area, specify "action-start" or “action-end” as the “type” attribute of the <child> element. hich contains one subnode per tab with name tab. The main node gets the .frame style class when the notebook has a border (see set_show_border). Appends a page to this. Appends a page to this, specifying the widget to use as the label in the popup menu. Gets one of the action widgets. Gets the current group name for this. Returns whether the tab label area has arrows for scrolling. Returns whether a bevel will be drawn around the notebook pages. Returns whether the tabs of the notebook are shown. Returns whether the tab contents can be detached from this. Returns the tab label widget for the page child. Insert a page into this at the given position. Insert a page into this at the given position, specifying the widget to use as the label in the popup menu. Switches to the next page. Prepends a page to this. Prepends a page to this, specifying the widget to use as the label in the popup menu. Switches to the previous page. Reorders the page containing child, so that it appears in position position. Sets widget as one of the action widgets. Switches to the page number page_num. Sets a group name for this. Sets whether a bevel will be drawn around the notebook pages. Sets whether the tab can be detached from this to another notebook or widget. The create_window signal is emitted when a detachable tab is dropped on the root window. 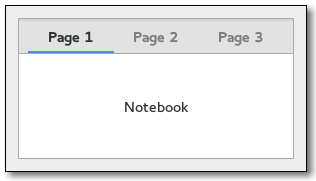 the page_added signal is emitted in the notebook right after a page is added to the notebook. the page_removed signal is emitted in the notebook right after a page is removed from the notebook. the page_reordered signal is emitted in the notebook right after a page has been reordered.